Solid, convenient source of brilliant, opaque watercolour. 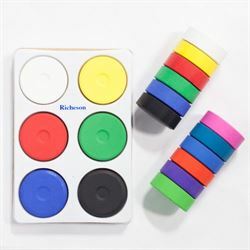 Ideal for distribution and collection in the classroom. Will not deteriorate in storage and are instantly useable with the addition of water. Appropiate colours can be mixed to produce intermediate hues.